Did you know the Mavenlink experience can be customized to your brand? Custom branding allows the Mavenlink interface to feel like an extension of your business. When your team members and clients collaborate inside the application, they’ll feel like they are using your application — not ours. 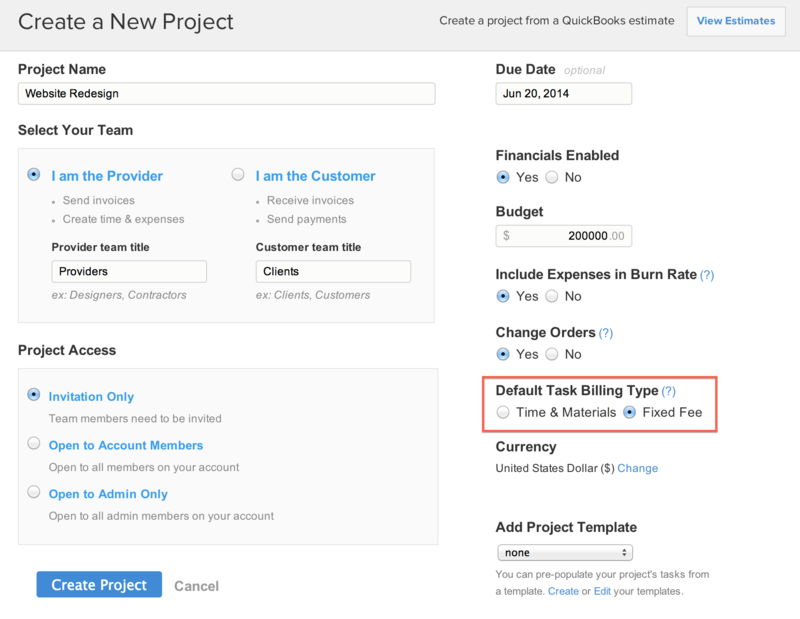 Your Mavenlink projects are home to so much information: your team, their hours, project tasks, shared files, etc. All that information means that good organization is a must for running your projects in Mavenlink, which is why we built Project Groups. One size does not fit all. While we try and think of everything our customers may need and build it into our software, we understand that there are certain unique aspects every business must account for. We’re happy to announce that the new Project Templates are now available to Mavenlink Premier, Professional, and Teams customers. Our Product and Development Team has a culture of perfecting, meaning we’re continuously improving features, even after they’re shipped. Tasks have been around on Mavenlink for a long time, but now they’re more powerful than ever. 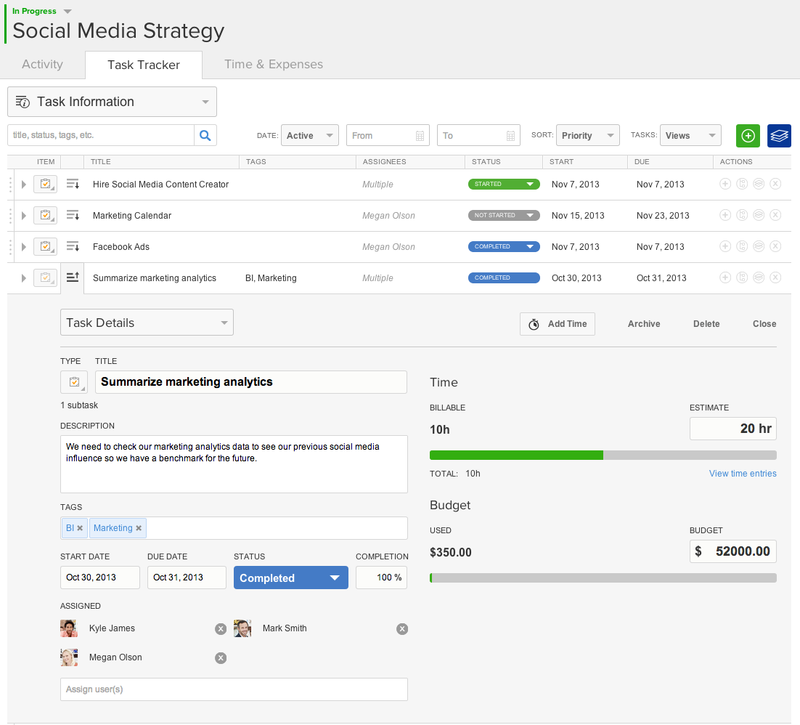 In addition to the new checklist feature, you can also interact with your team directly on a task. Today, we’re excited to announce the launch of the Mavenlink Academy Knowledge Base, our new educational resource center. Think of the Knowledge Base as your personal guide to Mavenlink, complete with product information, live support, and resources. Now, when you access the Support area in Mavenlink, you will be able to view an ever-expanding database of product information, user guides, tutorial videos and more. 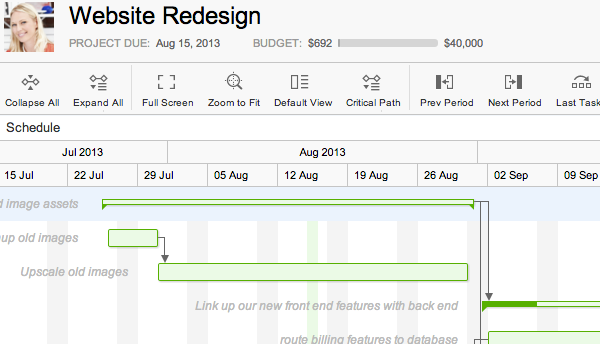 Mavenlink’s new Gantt Chart Baseline tool enables you to take a snapshot of an initial baseline as well as additional snapshots of your project's progress. This can help you to visualize the difference between your projections and the reality of your project’s progress. To develop Master Planning, we worked closely with customers in the IT, Development, and Marketing industries. As a result, Master Planning plays nicely with the task-level resource allocation tool you may already use. Bottom-up planning, found at the task level, bubbles up the Project Manager’s allocations to this new global view. 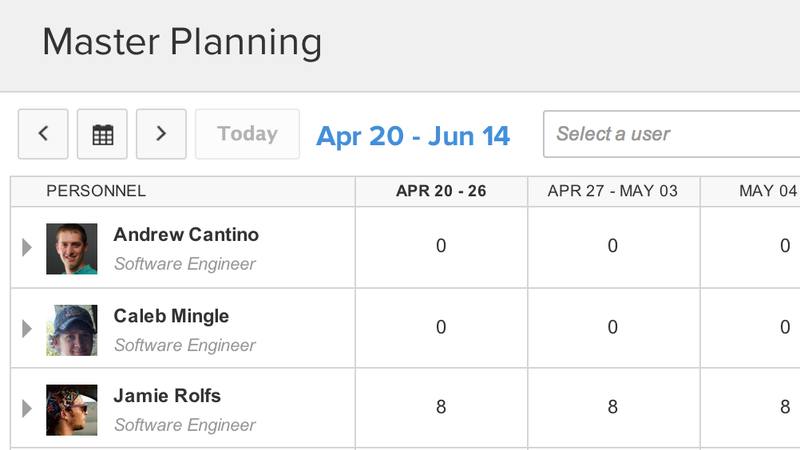 From Master Planning, admins have visibility into how their plan translated into the resource’s actual schedule. Resource Planning just got easier with Mavenlink’s new Resource Shaping Tool. 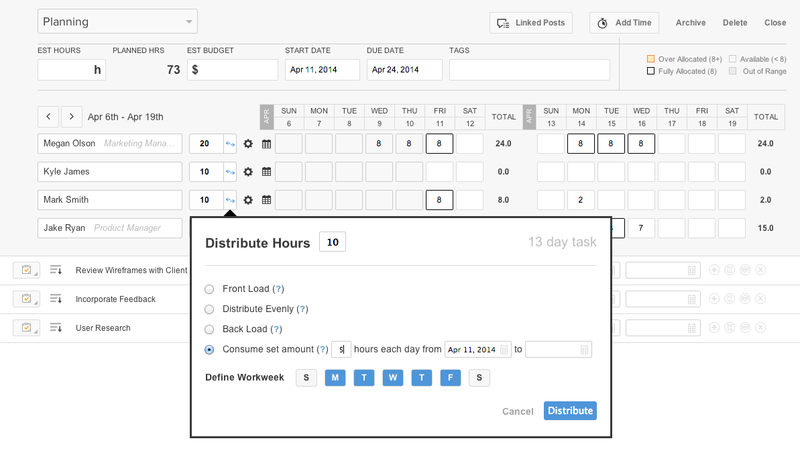 Found under Planning on the Task Detail’s section, this functionality makes it easy to define a resource’s workweek and apply hours automatically. With the new Project Access feature, project creators can now set projects to be "open to all members on your account," "open only to admins," or "accessible by invitation only." Creating and managing your daily “To-Do” list is an ever-present activity common to businesses of all sizes, regardless of industry. According to a recent study by the Harvard Business Review, workers reported spending as much as 41 percent of their time on discretionary activities that could be managed more efficiently by other means. At Mavenlink, our customers guide the future of the product. 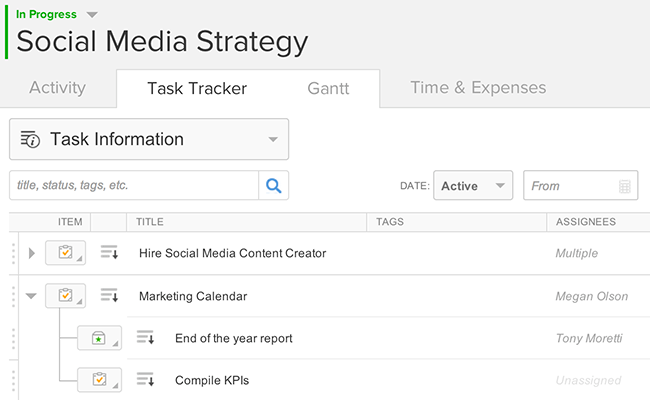 We've heard a lot of feedback from customers about the old project task tracker and have worked hard to upgrade the experience. It was created before many of the powerful capabilities that Mavenlink customers use today were built, such as Gantt and subtasks. As our customers' usage grew, we found a need for a more streamlined experience that can handle large numbers of tasks. According to a recent survey of 150 project management professionals conducted by leading industry research firm Gartner, a project’s schedule and timeline must stay realistic and yet be flexible enough to accommodate a change in a project’s scope in order for the project to have the best opportunity for success.